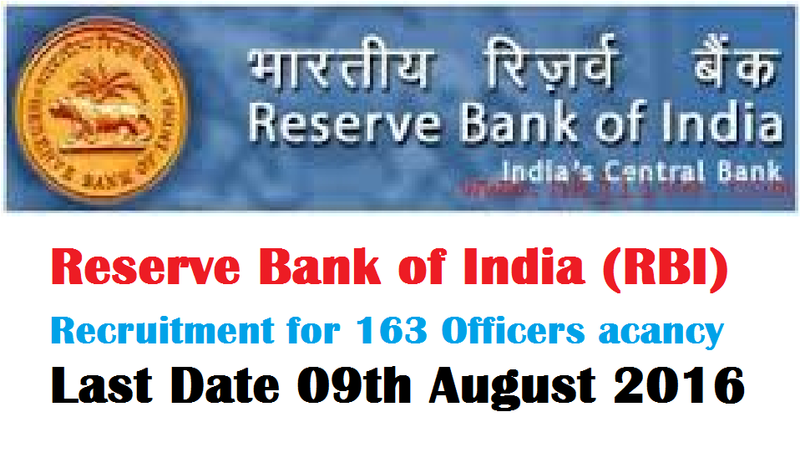 Reserve Bank of India (RBI) invites application for the post of 163 Officers in Grade B (General) by direct recruitment. Apply Online before 09 August 2016. Educational Qualification : A minimum of 60% marks (50% in case of SC/ST/PWD) or an equivalent grade in Bachelor degree as well as in 12th (or Diploma or equivalent) and 10th standard examinations. The minimum qualifying percentage or an equivalent grade for the Bachelor Degree will be in aggregate for all semesters / years. Selection Process : Selection will be made on Online Examination (Phase-I &II) & Interview. Application Fee : Candidates belonging to General /OBC have to pay Rs. 850/- & Rs. 100/- for SC/ST / PWD candidates through the Online by using Debit Cards (RuPay/Visa/MasterCard/Maestro), Credit Cards, Internet Banking, IMPS, Cash Cards/ Mobile Wallets. 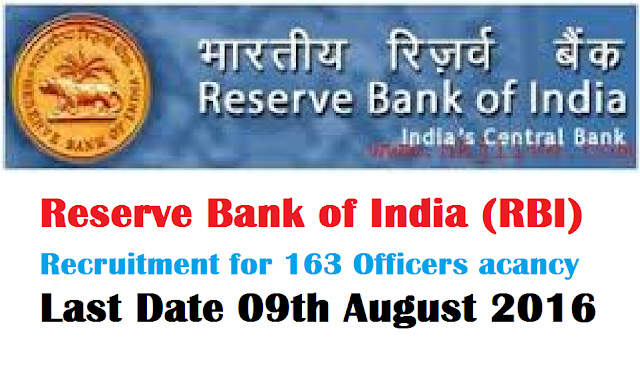 How to Apply RBI Vacancy : Interested candidates may apply Online through the website https://rbi.org.in/ from 18.07.2016 to 09.08.2016.